If you have a moment or two, please tell me your “sports story”―what you want to achieve, why you play, or even explain the adversity (difficulty) you might be facing as you strive to reach your goals. Just click the “Submit Your Story” link below to send your story in. Or you can email it to me―just make sure to place “My Story” in the subject line of the email. And don’t forget to give me the sport(s) you play and your name so I can give you credit. Thanks so much for stopping by!!! I have played many sports baseball, soccer, wrestling, football, cross country and martial arts. I started lifting weights and running long distance in 7th grade. Through hard work and determination, I have been able to achieve many great things. I was crowned the Iron Man the summer before 10th grade. I joined a group named Sea Cadets. It is comparable to JROTC. My Senior year, I was a western conference champion in wrestling, and I became the second best runner, which, my senior year was my first year running cross country. I hit my personal record 5k at 17:59. My willingness to want to be the best is and was always pushing me harder. I may come up short of a victory, but that only pushes me to want to become better. I joined the military reserves, and I set the highest physical training score while in basic training. I was made the Platoon Guide for 13 weeks. They first told us there would be a new one each week, but they never fired me. Even though I would of liked to free myself of all the extra duties, it embedded a structure in my mind I would never give away. I led my platoon to win the honor platoon award, and I established myself as the honor graduate. I now hold the highest physical fitness score in my company that I am assigned to, and I am honing in on my skills in mixed martial arts. I desire to become the best, and I will let nothing stop me until I reach my fullest potential, in which, I will never achieve my fullest potential so I will continue to train till the day I die. As a high school official I have seen the evolution of concern over concussions, and rightly so over the last several years. A release was just sent out 2 days ago by the PIAA, the governing body for school sports in PA. It itemized the rules to be followed if an athlete shows any signs of concussion at all. He/she may not re-enter the game unless a doctor (not a trainer) is on staff at the game and authorizes it. In other words that athlete is pretty much done if the official feels so. I believe this is the right approach. In my 39 years of officiating I’ve seen some serious head injuries that were not treated with the same caution and could have resulted in tragedies. When I was a football player years ago I suffered several concussions, and went back in the game. I remember that feeling, and it was very unpleasant, but I did what the coach told me to do. This is why informed adults need to be in charge of situations like this, because the athletes will do whatever the coach instructs. I am a self-taught tumbler. Gymnastics and martial arts were my passion. Then when I joined cheerleading (to keep me out of trouble and to get more tumbling in) I was part of a team that was taking top three in state in high school. I put my mind into learning a backflip on my own without a proper facility or coach, and it took me far. Mind over matter always will forever be true. After freshman soccer season I became motivated to be a better player and a better athlete so I started off-season the day after soccer ended. After training restlessly during the winter season I went to club soccer to get ready for fall again. I was immediately aware of how much I have grown as an athlete and how important off-season training is. If you waste any season not playing or training it will be a rude awakening when you come back to your sport. I had never played a down of football when I arrived to summer football camp. However, I was determined and my goals were already set. I wanted to be a starter on the A-team. The coaches split up the players and I was on B-team, but that wasn’t good enough for me. So I worked until they moved me up to A-team. After my freshman season I set my goal for the upcoming season, to be on varsity. The next season after only playing one year of football, I became the starting defensive tackle for the varsity football team. Then adversity struck my junior year. A week before my teams two-a-day practices I ruptured my ACL, ending my junior season. There were many times during that ten month period that I wanted to give up all my dreams that I had, dreams to play again my senior year and my dream to play college football, but through the help of my family, teammates, and Jesus Christ my Lord and savior I pushed through. I played my senior year making the All-area team, and helping my team get to the third round in the IHSA playoffs. After the season I accepted a scholarship to play College football. Obstacles can only stop you if you let them, fight through and become the best you can be. Running for me is a mental game. Whether I’m trying to set a new personal record or reviving an award. It’s more mental than anything. I run cross country and track and the only days I’m not running are the four total weeks out of the year we aren’t allowed to. I push myself to be the best I can be and strive to be better. My goals are to make varsity in cross country and track. I’ve got a lot working against me but if I believe in myself I will get there. At the age of 15 I was entering high school and all of the exciting opportunities that come with it. I had been a ballet dancer most of my life, and that summer my friends talked me into being part of their team to try out for cheerleading. I said I would but wasn’t really interested in being on the squad. With my dance experience, ultimately, I was the one to make the squad and that meant giving up being part of the ballet company – although I still took classes. I chose to join and within months disaster struck. I was on the sidelines of a football game, my back turned. My friend yelled for me to turn around and when I did two football players hit me, going after the ball. I had torn my ACL and had to have surgery. It was a hard time for me emotionally to be cooped up at home and limited physical ability. I was sad that my dancing days were effectively over, but a door would open. I was also blessed with a musical talent and I took the same discipline I learned in dancing to it and also, with determination, began taking classes again, which turned out to be the best therapy. I switched my focus and that door led to a music scholarship at a state university. Although I ended up changing my major, music and dance have always been part of my life, and I’m left to believe that everything is just a step to somewhere else you’re supposed to be or do. That determination, hard work and discipline led to starting my own business, of which I am proud to say I’ve had for more than 11 years. Sports have always been a huge part of my life. I grew up playing them ever since I can remember. In the seventh grade I followed my passion and focused solely on playing volleyball. As a freshman it was my goal to play on our high school’s Varsity team. The goal was lofty and proved to be the first true failure and adversity I had faced at that point in my life. I made the sophomore team as a freshman which was disappointing because this team was far from where I wanted to be. Looking back on it may have been the greatest thing that happened because it made me even hungrier and drove me to play for one of the strictest, straight edge clubs in the country. It proved to be a challenge day in and day out to master each skill of my position, but my mind was always focused on the bigger picture. The following High School season I had the honor of playing the position I had dreamed of for my Varsity High School team. My sophomore year club season proved to be my second defeat as I walked out of club tryouts with tears rolling down my face because I made the second best team. That year I put in hour upon hour after practice in repetition of the skill I knew was my downfall. The following year proved to be my biggest goal yet in making the 18-elite team coming from the second 16’s team. I have never been more proud than when I accomplished this goal. Along with it came the championships and the future opportunity to go on and play in college, but ultimately these successes came from the ground work put in to accomplish this goal. Looking back from where I am today…I am taken aback by how everything, eventually, came together. As a kid whose mother couldn’t believe how much energy I had, flipping off couches and hanging on the clothes bar in the closet, she signed me up for gymnastics at age 5. In short order, I started competing compulsories, and by 9 or 10 moved to optional competition. Fairly quickly I became interested in becoming an elite level gymnast and joined the Atlantic Gymnastics Training Center in New Hampshire. In my area, if one wanted to be an elite…that was where it would happen. For me, it was a great switch, as I loved the challenge this gym provided, and I grew tremendously because of this. However, tougher training and high expectations tend to bring with it higher risk, and after returning from an International competition in France, at age 12, I developed a pretty serious shoulder injury. It was bad enough that I left gymnastics to pursue diving. My diving coach told me I was a natural in the sport…and my freshman year of high school I broke all kinds of records, making a solid impact in diving throughout my high school career. However, something seemed to be missing…I simply did not have a passion for diving…at least not like I had with gymnastics. It was this passion for gymnastics that brought me back to the sport…and back into the gym for training. With a new, revived outlook, and a recently acquired driver’s license (giving me more freedom), I felt ready for the challenge gymnastics would bring. I pushed myself hard…and fast, maybe too hard and fast, and again I developed injuries. This time in both my feet and my back – which was fractured…injuries serious enough to require surgery. This was a big setback…things looked bleak. It was my second chance in the sport I loved (you don’t get many of those) and I knew that I wouldn’t be able to take another 3-year break. Nor did I want to. I decided to take an extra year of high school in order to rehab, continue training, and hopefully be recruited for college. I just wasn’t going to give up…I had come so far…and I wanted so much more. This was a very hard time for me, yet my work paid off as I accomplished going to JO nationals 3 years in a row and received a full scholarship to University of Alaska-Anchorage. At first, all seemed good; however, it quickly became apparent that this college program wasn’t as competitive as I originally thought. In addition, I had hurt my knee my freshman year, and again needed surgery. I also decided to have surgery sophomore year on that shoulder injury I had from my younger years. These injuries, surgeries, and obstacles just seemed to keep piling up. It was at this time I knew I needed another change, as the college program I competed for just didn’t seem to be the right fit for me. Hoping for a better fit, I transferred after my sophomore year to the University of Bridgeport, with Coach Byron Knox. This truly was the turning point in my gymnastics career…and one of the best decisions of my life. Bridgeport was a Team. Byron and assistant coach Becky do an amazing job, and my gymnastics, as well as my mindset, completely changed. I had found the right place to be…and the love for my sport grew immensely under them. I graduated from Bridgeport with a degree in psychology and a new respect for gymnastics. Yet…I still didn’t feel complete…there was still something missing. I decided to continue training, at level 10, to satisfy my competitive spirit. Not long into my training, Tammy Biggs came to our gym to provide a clinic of instruction. She saw me training off to the side and asked my coaches if I ever thought about becoming an elite. Ah…YES!!! I figured if she thought I could…well, why not…and proceeded to do everything I could to impress her and make her happy with my efforts. This was so incredibly difficult for me…elite training is very intense. But as hard as all this was…I did qualify out of elite compulsory and at my first [elite] optional meet, I was only four-tenths away from making it to the Secret Classic. This is a meet where many of our Olympians compete. Not making it by only four-tenths was heartbreaking…but, looking back, I eventually realized that what I had accomplished, up to this point, was much more than what I had originally set out to do. Especially with all the setbacks I had. After reaching my peak in artistic gymnastics, I took a year off. It was during this time that I thought I was done with USA gymnastics. Little did I know. During that year layoff, I started to feel lost…I couldn’t seem to find myself…who I was. Gymnastics had defined me for so long. I had a lot of respect for Byron, my former college coach, so I took it upon myself to give him a call. I felt if anyone could help me…he could. Byron mentioned the idea of me power tumbling. Hmm, that sounded interesting, and the next day I made a trip to a gym to try it out. WOW…seemed like a perfect fit for me at this stage in my life. I drove 3 hours each way to train determining that if I make senior elite, I will fully commit myself to making it to Worlds. I qualified senior elite at my second meet ever in the sport! It seemed like all that training in artistic gymnastics had certainly paid off. By my 5th competition, I was second in the country and made the national team! The gym I was training at only had a floor 1/2 the length that I was competing on, making things especially difficult, so I told myself if I ever made the national team (thinking it would be years in the making) I would relocate my life to train at a gym with full regulation equipment. For me, this happened in only 3 months after my first competition. I decided if I was going to move, I would move to train with the national team coach in Virginia. I had two months before the camp at the ranch that decided the Worlds team. I pushed my body to the absolute limits. I upgraded my difficulty by more than a point! And guess what? I DID make the Worlds team. It was the happiest day of my life…all my efforts had really paid off. Competing at Worlds was an amazing experience; however, I had pushed my body so hard, unable to rest, that I fractured my shin, my back at L5, and tore my labrum in my shoulder. I was in so much pain…but there was no way I would stop now. I competed the best that I could and recorded the top 3 scores for team USA! I felt great with what I accomplished in one year in the sport! In the end, I had gone through so much…so many injuries, surgeries, obstacles, feelings to filter through, it’s mind-boggling. My unwillingness to give up in the face of difficulty is what led me to accomplish my goals. It is this piece that I will be able to carry through the rest of my life. It certainly has been a wild ride…so far!!! 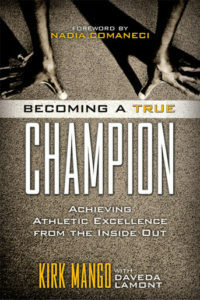 Use the form to send me your story or you can email me at batc@becomingatruechampion.com. Submission of your story signifies that you are the owner of that story, it is truthful, is about you, and that you are giving me permission to post that story on my website here at Becoming a True Champion. Neither you, nor anyone else, can hold Kirk Mango or anyone associated with this website liable for damages of any kind resulting from the publication of your story on this site.